Home / QuiBidder of the Week – Janice C.
We’d like to introduce the last QuiBidder of the Week of 2013, Janice! Janice is from the United States and has been bidding on QuiBids for over a year now. Keep reading to learn more about her bidding experiences. Click HERE to submit a photo of you with your wins and answer some questions and you could become the next QuiBidder of the Week and win a $50 gift card of your choice. Have you ever given your QuiBids wins away as a gift? Have you ever bought anything from the QuiBids Store? What’s the most bids you’ve won from a QuiBids Gameplay? What’s some good advice for new QuiBidders just starting out? 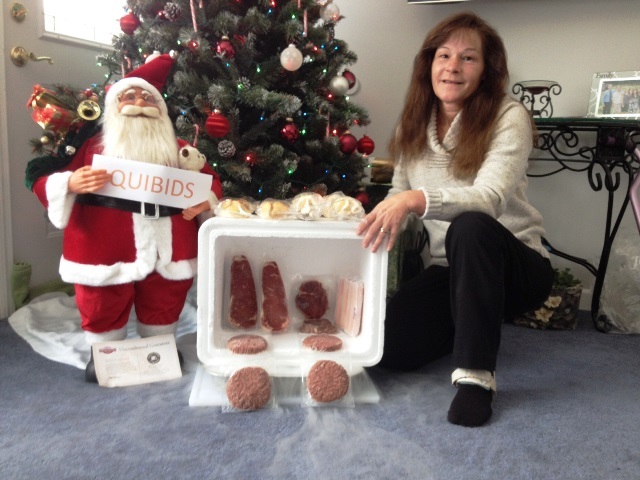 Thanks again Janice for sharing your QuiBids experiences with us! Do you want to share your story here on the blog? Click here to submit your photo and story and if selected you could win a $50 gift card of your choice!